When heartache and loss invade Karen Pierce's carefully ordered world, she is devastated. Her plans and dreams for the future seem distant and unattainable, and she is bound by a promise to care for two young adults who are struggling with a loss of their own. Continuing their journey north to the goldfields seems their only option, and Adrik Ivanov agrees to be their guide. With the constant threat of winter hastening their pace, Adrik wonders at the wisdom of their decision. But he longs to prove his commitment and growing love for Karen, who has pushed aside his advances in the past. Inspired by the beautiful and rugged landscape, Karen thrives under the difficult conditions of their trek. As her heart begins to journey back to the core of her once-solid faith, will she dare to embrace the love offered to her? The second in the Yukon Quest series finds Grace and Peter married, after fleeing Martin Paxton . . . and Karen Pierce, still in Alaska, caring for two children, whose father has left in search of gold . . . Karen, still grieving the death of her father, and now the loss of her aunt Doris, bitterness fills her heart, and she becomes angry with God . . . questioning His plans . . . Adrik Ivanov, native Alaskan and friend to Karen's missionary parents, has come to love Karen . . . but Karen cannot deal with God or Adrik . . .but in His time, God deals with Karen, as He does with all of us, who belong to Him . 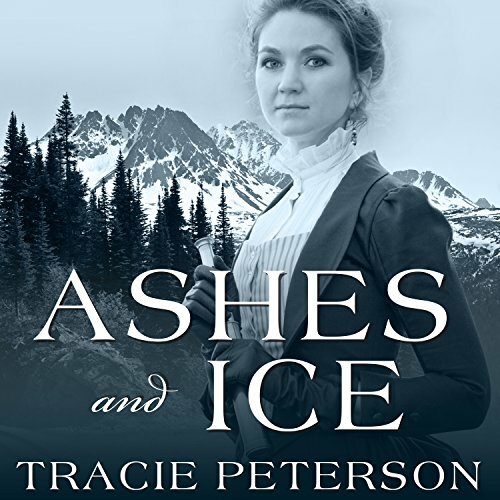 . . Ashes and Ice is all about relationships, sweetness in the family of God, harshness and struggle as destructive as the wilds of Alaska, and facing down evil in the name of Jesus . . . one of the best parts of the book to me is the relationship that develops between Grace, Miranda, and Peter's parents . . . bringing full circle God's grace and love . . . there is yet much to be resolved, and I am on to the final book in the series . . .
Tracie Peterson is so talented in bringing to life each character in her book. This is one of a series and follows "Treasures of the North". There is all of the emotions in this book, happy sad, anger,.pleasure,and satisfaction. The narrator Laurel Merlington is absolutely amazing. The book is full of characters that through her amazing talent, gives you no doubt who is speaking. By far the best narrator ever !!! Awesome adventure. I felt like I was traveling in the far north with the characters on their adventure. Superb read! loved it, great story line, at times my emotions was on a roller coaster ride, but in the end it was good. Hmm...maybe the next will be better. It was predictable, in some ways. The author did a pretty good job leading up to it without leaving it as a big surprise. More Adrik and Karen, I would have likes to hear more about how they developed but surprisingly there was a lot of it skipped over. Maybe the next book will be better. I've heard nothing but good reviews so I'm willing to give it a try! I love the Christian values the women and Adrik hold and that kept me listening, though the book wasn't one of my faves. I don't know if it's the story or the narrator. This book is not a typical Tracie Peterson that I usually enjoy. Her voices are so sugar sweet. Or they just make the young ladies sound pathetic. And their dialogue is a bit pathetic. She preaches at her unsaved husband like he's an idiot. Oh but she loves him SO much. Don't waste your time and credits on this one.